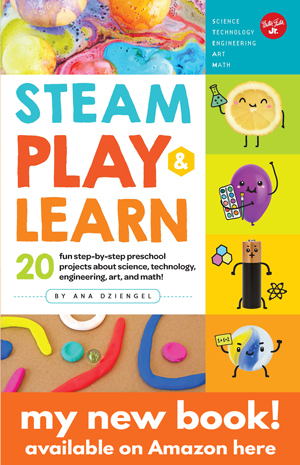 This is a 5 part series I’m working on with 7 other talented bloggers who all love to explore STEAM projects. For the next 5 weeks we will bring you 8 projects centered around a topic. This week’s topic is FLY. For our flying project we decided to play with air and the concept of a vortex. I love that word, don’t you? I actually discovered this project by accident a few months ago. My son loves balloons and we were playing with one near a fan when it bounced over and got caught in the vortex of air coming out of the fan. My kids were thrilled watching the balloon dance and hover over the fan and I thought your kids might like watching this phenomenon too. 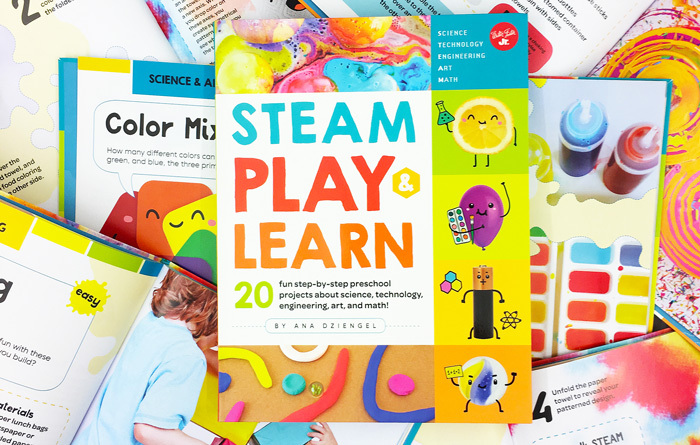 Think of it as flying, floating, balloons dancing on air! Steps One Make a “tube” out of poster board by taping two boards together to form a cylinder shape. The circumference of the cylinder should match the circumference of your fan. You want to tube to sit on top of the fan. Step Two Blow up your balloons and place the tube on top of the fan. Step Three Turn on the fan to a medium setting. You’re done! 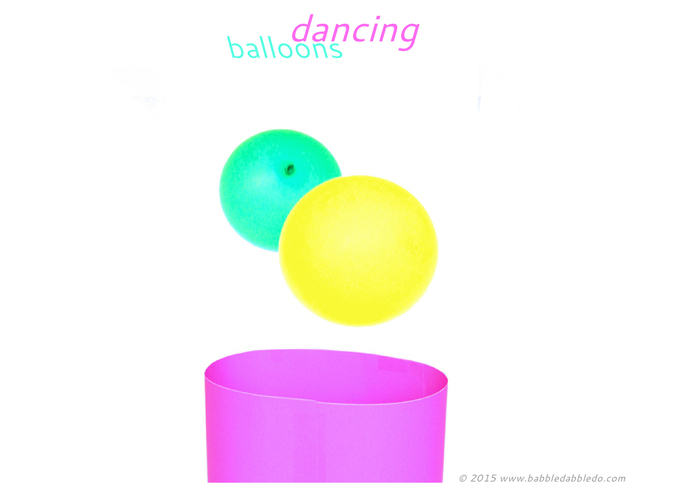 Watch the balloon dance in the vertex of air! A poster board cylinder is not necessary for the project but I did find that it helped produce a more concentrated flow of air. The fan must be elevated and the tube cannot touch the ground! In order for the fan/tube combo to work properly you will need the fan to be elevated off the ground and tube sitting ON TOP of the fan to be able to pull in air. You will not be able to lay a fan on a table without space below it and have this experiment work. Do this inside! Even the slightest breeze will cause your balloons to drift off and the experiment won’t work. The best place to try this is inside away from a breeze or drafts. Now the fun part, how many balloons can you get to dance at once? One balloon is easy, two is tricky, three and four are tough! But we did it! Slowly add more balloons in and watch as they dance around each other and bump each other out. It’s kind of like watching a school dance party. Mechanical fans work by sucking in the air that surrounds them and them pushing that air back out in a breeze. Because the blades are rotating in a circular fashion, the breeze that is generated becomes a VORTEX, a mass of whirling fluid or air. Because the air is invisible you are not able to see the vortex until you place something in it that is affected by its movement, something light like a balloon. 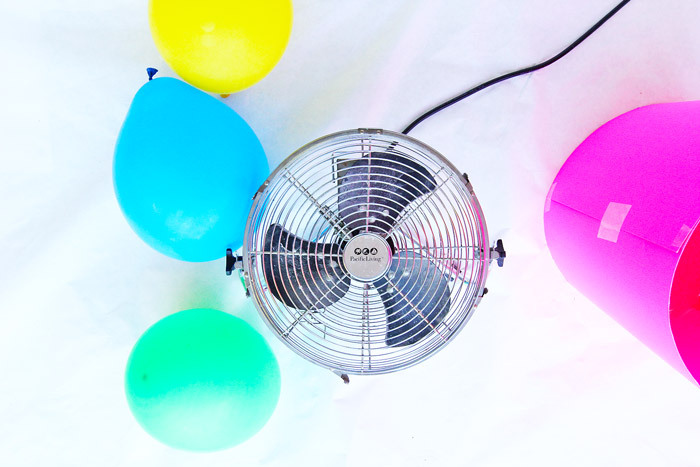 The balloons are easily pulled into the air vortex above the fan and held in place. 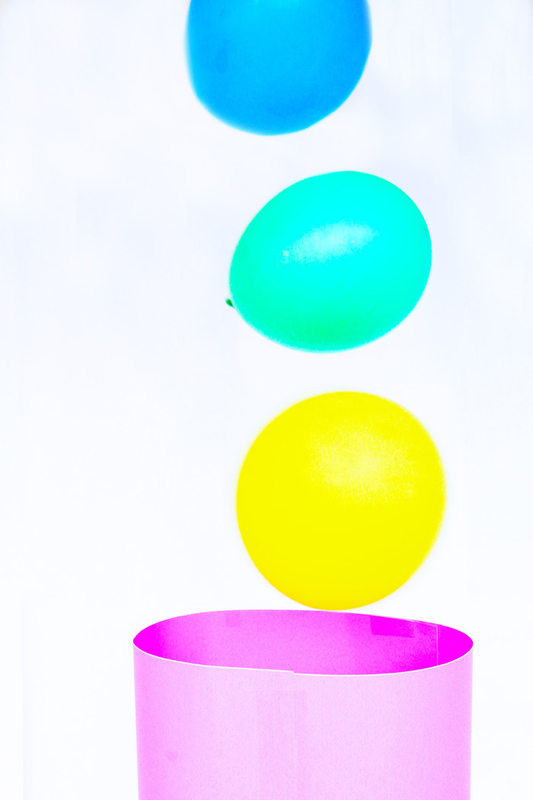 If you add too many balloons, however they begin being bumped out of the vortex. Other examples of vortices are tornados, hurricanes, and whirlpools. Take off the poster board tube and observe how the balloons move. They should still dance but over a larger area. 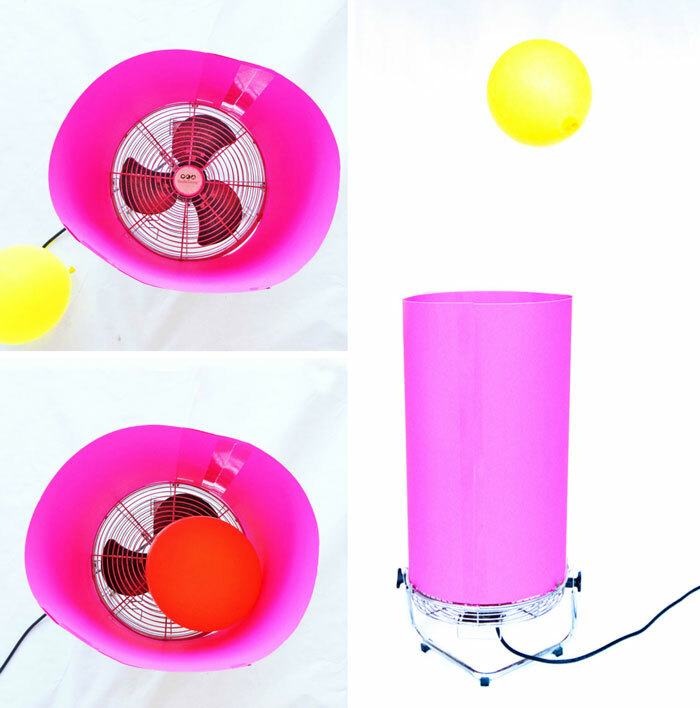 Adjust the fan at different speeds to see how it changes the strength of the vortex. Use different sized balloons and see what happens. Try using three fans pointed towards one center point. We did not try this but artist Daniel Wurtzel (see below) often uses multiple fans in his works of floating art. Daniel Wurtzel. I discovered artist Daniel Wurtzel when I googled dancing balloons as I was prepping for this post. Mr. Wurtzel exploits the movement of air to create wondrous moving art pieces. And it turns out he pretty much did the same experiment we did only as an art installation. But don’t stop there. His moving art created by trapping fabric, paper, balloons and more in air is mesmerizing. Here is a prime example: Pas de Deux He even created a giant Paper Tornado as part of the 2014 Olympics Closing Ceremonies. Check out some videos of his work here. Ready for more flying action? We recently built a wind tube (directions at http://www.gooddayswithkids.com) We’ll have to try flying balloons over it! You are officially the video master. This is so cool! Thank you so much for adding in the “A” to STEAM!! I love the art connections you make in your posts and the new artists I’m discovering because of your blog. Wurtzel’s work is mesmerizing! Thanks Leah! And so happy to spread the word about fabulous artists and makers! We kinda do this dancing balloons activity every time we vacuum the house. This is a nice alternative. I’ll have to try that! How do you do it? 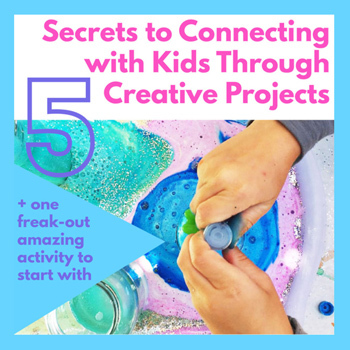 Where can I find the other blog posts for the five part series? Waaoww… Will try this with my kids. Thanks for the idea! We did this today and the kids really liked it. We saw balloons knocking each other out. we also blew up balloons to be really big, small and medium and talked about which ones went higher and why. 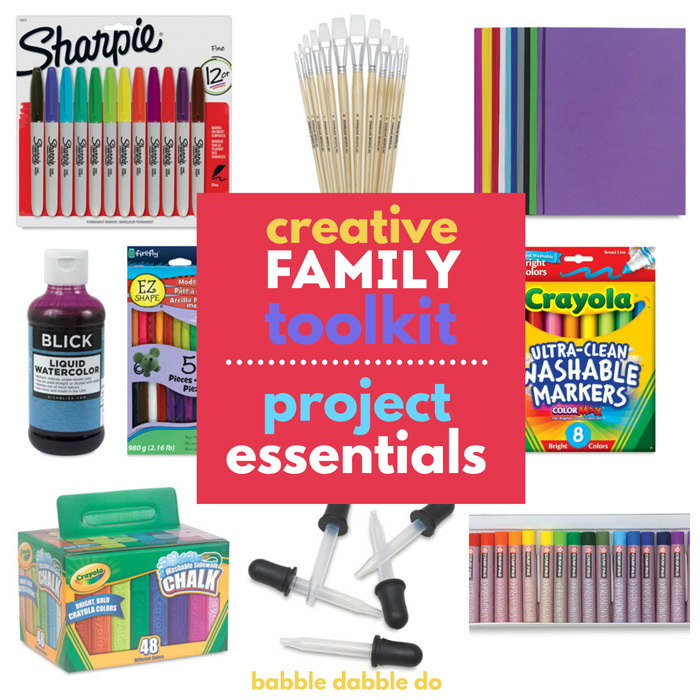 Fantastic add-on ideas! I’m so happy your guys and a blast with this! This was a very interesting way to share science with youth. Creating a vortex with a fan and balloons must have been fun as well.